Home > Dog Gear > Best Dog Treadmill for 2019 – Exercise Without Leaving Home! The importance of getting enough exercise for your dog can’t be overstated. If you’re a dog owner like us, you know just how much better behaved and happy your pooch is after being thoroughly exercised. Mental stimulation. If your dog spends all day sitting inside with no new experiences, it’s going to suffer from boredom! While you can use some great dog puzzle toys to help work their brain, getting them moving is a vital way to stimulate their brain and body. Maintain a healthy body. Having a habit of activity is key to your dogs long-term health. 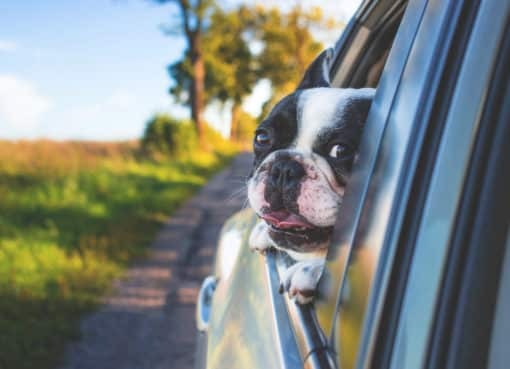 Vets estimate that up to 40% of pets are overweight in the United States, which can lead to expensive health issues like diabetes, hip dysplasia, and shorter lifespans. Avoid behavioral issues. Some high-energy dog breeds such as shepherds or terriers may act out in undesirable ways if they are not exercised enough. This could things like digging a hole into your couch or tearing up the carpet – all costly problems to fix! It’s much cheaper in the long run it exercise your dog instead. Now that we know the benefits of exercising your dog, what if your living circumstances don’t allow for it? If you live in an apartment building that doesn’t have a yard space for your dog or a park nearby, finding a suitable place to walk your dog might be difficult. Also, for those who work all day, you might not get home until after dark and don’t feel comfortable walking your dog at night. The best fix for these woes is to get your dog one of the best dog treadmills! When you’re picking out a dog treadmill, there’s a few key features that you’ll want to focus on to find the perfect one for your dog. Treadmill size. Dog treadmills come in specific sizes to match the size of your dog. 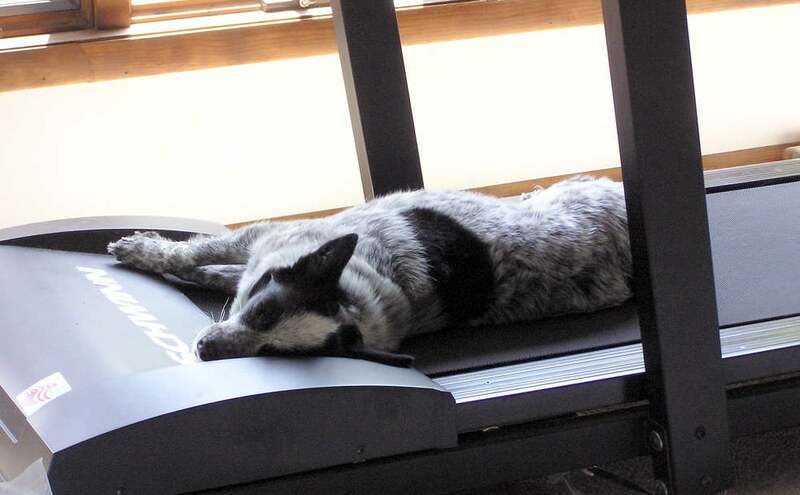 Of course, a smaller dog can use one of the larger treadmills just fine, but you may prefer the smaller footprint of a smaller treadmill if you can get away with it. Treadmill speed. Most treadmills range from .5 to 7.5 mph, but you’ll want to make sure the speed of your treadmill matches how your dog likes to exercise. Speeds around 1-3 mph will be walking speeds, depending on your breed, and 4-7 mph will be jogging/running speeds depending on your breed. Treadmill dimensions. If you have limited space, you’re going to need to make sure the treadmill you buy will fit where you need it to. Most manufacturers are great about listing the dimensions of their product so there’s no surprises when it arrives. Side walls/bars. To prevent your dog from jumping off the side of the treadmill, most dog treadmills come with side wall/bar attachments that keep your dog moving in a straight line. This is especially beneficial when your dog is first learning to use the treadmill. Easily accessible controls. Dog treadmills typically have the controls of the treadmill orientated away from the dog, towards the front of the treadmill where you can easily make adjustments. Some even come with remotes that allow you to make adjustments without being near the unit! 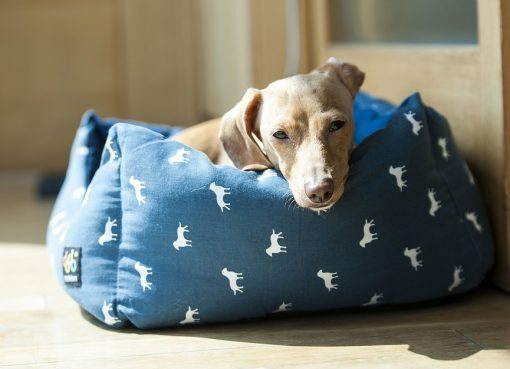 Designed for doggies! If you’ve ever tried to walk a dog on a human treadmill, you’ve probably seen some of the issues that come along with it. For starters, dogs will often run off the side of the treadmill or accidentally step front two paws on the plastic that covers the motor at the front of the treadmill, damaging the unit and interrupting their exercise. Longer walking areas. Very important for big dogs! Now that you have all the background you need, lets dive into our best dog treadmills! 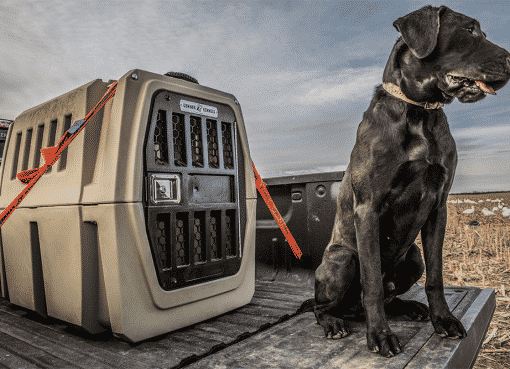 The dogPACER LF 3.1 is the ultimate dog treadmill for a number of great reasons that we’ll get into, but lets go over some of the basics to start. Built for dogs of all sizes, this treadmill is well-built and can be used with virtually any dog, up to 179 lbs! This treadmill has speed adjustments from 0.5 to 7.5 MPH which is great for all breeds and sizes. The incline is adjustable from 5 to 9 degrees if you want to give you dog different levels of challenge. One thing to note about the incline is that it must be manually adjusted before your dog is using the treadmill, it can’t be changed while in use. The dogPACER LF 3.1 comes with a 1 year warranty on all parts, and a lifetime warranty on the steel frame. You’ll notice in the photo above that it comes with lightweight, collapsible side panels to keep your dog moving forward and not jumping off. The entire unit itself weighs about 85 lbs. One awesome feature that makes this dog treadmill really stand out is the foldable design. When setup for exercise, this treadmill has a footprint of 77″ long x 27.5″ wide by 46.5″ high (where the steel side support beam comes up). When not in use, the treadmill can be folded down to only 42.5″ long x 22″ wide by 8.5″ high. This makes the DogPACER LF 3.1 perfect for those with limited space! 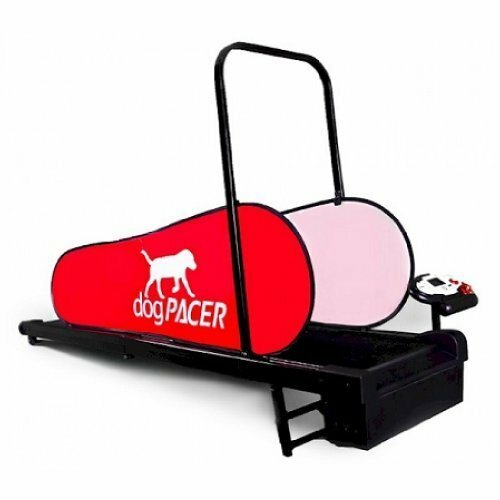 There’s also a dogPACER Minipacer model which is for dogs 55 lbs or smaller – this model does not fold up, and has dimensions of 42″long x 21.5″ wide x 28.5″ high when assembled. The treadmill lets you adjust the speed of the treadmill by 1/10th of MPH, and comes with 3 programmed “exercise programs“. These programs are of the easy, medium, hard variety that will automatically adjust the speed of the treadmill so that the dog will alternate between trotting and walking. For example, the easy workout will alternate between 1.5 and 3 MPH, which might work well for a smaller dog. You can manually tweak the speed if the program up or down while in use, which is great to get that custom experience for your pooch. The readout on the control panel will alternate between displaying the elapsed time in use (or time remaining if you’re running an exercise program), current speed, distance traveled, and calories burned. Since the dogPACER LF 3.1 has just about everything you could need from a dog treadmill, it earns our top pick for the best dog treadmill! Perfect for any size dog or breed, you won’t be disappointed by this choice. 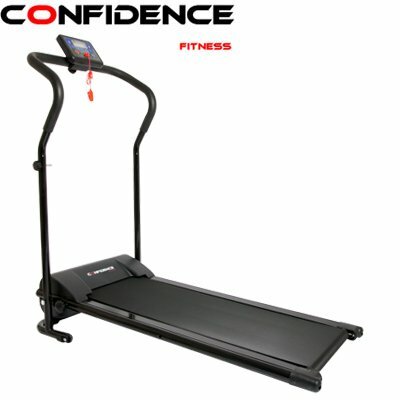 If you’re on a really tight budget and need the cheapest option available, you can take a look at this Confidence Power Plus treadmill, which was designed for humans but can usually be found for under $200. This treadmill has a 250 lb capacity and the speed ranges from 0.6 to 6.2 MPH. This treadmill can fold to a standing position for easy storage, which could be a selling factor for some people. It’s also very lightweight, at around 55 lbs. It’s important to keep in mind that while you are getting a treadmill for cheaper, it hasn’t been designed to be optimal for dogs. You won’t have the control panel facing away from the treadmill, or the side panels to keep the dog on track. Another major issue is that the motor in mounted in the front of the treadmill instead of underneath. This gives your pet the opportunity to step on the plastic covering of the motor at the front of the unit. Our 90 lb dog loves the scraping noise that gets made when he stands on the plastic, and will often try to do that instead of getting his exercise! It certainly can’t be good for the lifespan of the components. This treadmill does not have any incline adjust either, which is something to consider. It may look like a giant hamster wheel, but the GoPet TreadWheel is for dogs! It’s a really interesting alternative to a dog treadmill that requires no power to operate. The way the wheel works is the dog is placed into the wheel, and it can run or walk at its desired pace. At first you will need to teach the dog how to use the wheel (using lots of treats! 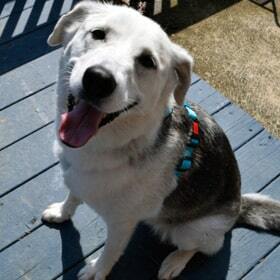 ), but typically in just 10 minutes your furry friend will get the hang of it. Many dogs end up loving the wheel and hop in it without their owners even prompting them. One unique advantage of the TreadWheel is it will allow your dog to sprint at full speed if it wants to! The only speed limit is your dog’s own ability. The above are the manufacture recommendations regarding dog weight. We would suggest that you size-up if your dog is anywhere close to their suggested max weight, especially if it’s a longer breed. If the wheel is too small, dogs have a more awkward time exercising. Given the weight of the medium and large TreadWheels themselves, they’re likely not something you’ll want to move around often. Check out the video below to see how much dogs enjoy a good run on the GoPet TreadWheel! That sums up our best dog treadmill recommendations, if you’re looking for more exercising tools check out our best toys to exercise your dog.